Barbados is an amazing little island. It is a beautiful place with something for everyone, but its beauty cannot be truly appreciated unless you hit the high seas and take in the views from a cruise. 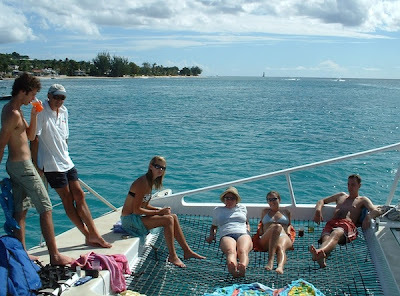 Luckily several operators offer catamaran cruises up the West coast of Barbados, out of Bridgetown Careenage. These are the best cruising waters as the Atlantic pounds the East coast making the water rougher. The catamaran cruises operate large catamarans that easily take about 30 people and probably more. As they round the south west point of Barbados it can be a bit choppy but as soon as you are around that point the bar is open and the rum punch begins to flow. The cruise heads North along the coast accompanied by a soundtrack of reggae rhythms and stops in sheltered bays for good snorkeling opportunities at various beaches and in the Folkestone Marine Park. Just north of Holetown there is a favourite haunt of the Barbados turtle colony, so it is not uncommon to get the chance to snorkel with turtles on these tours. The catamaran tends to pull into a bay for lunch and guests are given the chance to swim ashore and roam on the beach if they prefer. After that the cruise returns south to Bridgetown as the sun dips in the sky and cocktail hour approaches. If you can imagine yourself chilling with a rum punch on a gentle wave and a bit of reggae then taking a cruise on Barbados’s west coast is a pleasure that you should not miss out on.